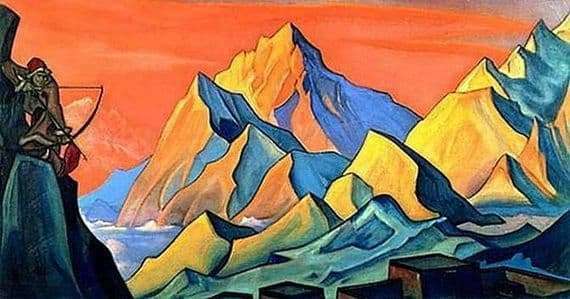 Roerich is a Russian artist, archeologist, traveler, author of thirty literary works, whose contribution to art is represented by a huge number of paintings – there are about 7,000 of them. Eternally susceptible to any kind of injustice, he painted pictures that were designed to wake the dormant soul in people, let the light into their hearts and remind them of the impossibility of any compromise with evil. The crime is softness, the desire for reconciliation, because the light and darkness are never reconciled, and the worst actions from which the world is shaken are always committed with the faint-hearted and silent. “News of Shabmaly”, it is “Arrow-letter”, shows the mountain peaks of the Himalayas, filled with yellow dawn light. The motionless silent mountains are covered with snow, silence reigns in them, broken by a barely audible, elusive sound – this tightly stretched bowstring quivers. The shooter, clinging to the mountainside, pulls onions. Creaking singing tree, bends in his hand. On the arrow a shred of scarlet cloth is fluttering – the banner of war. In Mongolia, since olden times, news from high-mountainous pastures has been sent – wherever a person cannot make it, an arrow, well-aimed from a bow, can reach. Stuck in the ground at someone’s feet, bring bad news. Shambhala is a mythical country. It exists only in the imagination of people, and represents a kind of paradise – the place where the gods live. The gods are benevolent and can do anything, but sometimes there are times when they cannot cope alone. When darkness rolls in, when the time for decisive battles comes, the gods call people capable of supporting them. And an arrow flies from the mountain peaks to the valleys, and the arrow in the red cap sings the bow in hand. The world is on the verge of great change. The world is ready to fall into the abyss. This theme of the apocalypse, the feeling that if everything goes as it goes, it will come very soon, is peculiar to Roerich. When the world will be ground with nuclear bombs – where then will the arrow fall and will anyone send it?